Media and Contents: 48 pages in A5 format and soft cover with 50 unpublished black and white photos, 1 colour photo, 6 pieces of colour artwork and one map. Over the last twelve months or so, I have reviewed U-Boot Im Focus No. 1 and 2 and was very impressed. This is a new series by the publishers of Luftwaffe Im Focus but, as the title suggests, focusing on German submarines. Generally, it covers the lesser known subjects of the U-boat service and has many never before published photos and excellent colour artwork including at least one side profile. It is bilingual, German on the left and English on the right and can be read from cover to cover. This then, is U-Boot im Focus No. 3. There are twenty articles in total, some showing U-boat types, Type 1, VIIC, ElectroBoats, etc, or just Conning Towers with both B&W photos and art-work. Then there are more specific titles like “Boot im Focus” on U-2519, one of the first Type XXIs that didn't quite get operational due to being damaged in an air-raid just before heading out to sea. “Portrait-Oberbootsmannsmaat Max Dittrich”. I read somewhere some time ago that about eighty percent of U-boat crews did not survive the war, so it is pleasant to read about someone who did. Max Dittrich joined up before the war started, did cruises on U-203, U-202 and U-178 which is remarkable in its self but also survived the sinking of the Wilhelm Gustloff, considered the greatest maritime disaster ever in terms of loss of life from a single ship sinking. In brief, the Wihelm Gustloff was a passenger liner of about 25,500 tons used to evacuate troops, naval personnel and civilians from Gotenhafen (Gdynia) in East Prussia on the 30th of January 1945 to escape the invading Russian Army. It is not known exactly how many were on board, any where from 6,500 to over 10,000. During the first night out she was torpedoed by a Russian submarine sinking in only 45 minutes with outside temperatures at -18C and loss of life of anything up to 9,000. This is a greater number than the Titanic, Empress of Ireland and the Lusitania combined. Max Dittrich, was one of the lucky ones in more ways than one. As I stated above in the Summary, there is always something of interest in these books, even if your main interest is not U-boats and the photos and artwork are added bonuses. 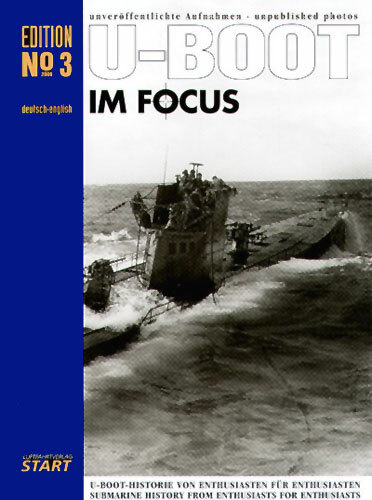 Like Luftwaffe Im Focus, U-Boot Im Focus is a keeper. Thanks to Start-Verlag for the review sample.